Recently, I had a friend tell me that he had found a house he and his wife loved, but there was excessive mold present. He asked if they should just walk away, and keep looking elsewhere. My answer was, “Not necessarily”. I told him that the mold is the result of a problem, but not the root problem itself, and until they discovered the cause of the mold, they wouldn’t know if the house is worth it or not. Mold is a big concern for many home buyers and owners alike, and rightfully so, as the presence of mold can be very hazardous. Mold is naturally occurring and breaks down organic matter, and returns it to the soil. However the presence of mold in a home can pose significant health threats, ranging from minor irritations to serious infections, and in some cases, certain types of cancer. When mold is found, remediation should be performed immediately. More importantly, however, is the need to determine the cause of the mold and fix the problem to prevent the mold from returning. Finding the cause of the mold may require a professional, but there is a great deal that can be done by a homeowner to locate and even prevent issues. The first thing to know is that a house needs to “breathe”. A well-designed house is one that has ventilation that promotes good air flow throughout the home. It is not that you want a home to be drafty, but there should be a fair amount of air turned over in a given day. 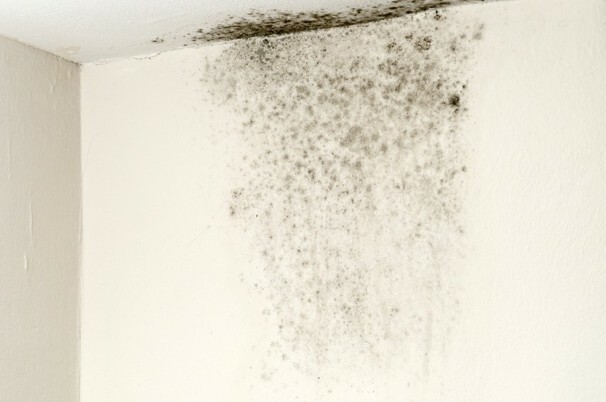 Mold can develop anywhere in a house, but a basement or an attic without proper ventilation, will have a tendency to hold moisture and develop mold. So how do you know if you have mold? There are a few indicators to look for. Often, the first sign is the presence of a musty or dank smell, if this odor is present you likely have a mold issue and finding and removal is necessary. The second way to find out if you have mold is by visual inspection. Mold can grow on any surface and can actually digests almost any material it comes in contact with, so when you are looking for mold, no stone can be left unturned. Mold can range in color and density. Typically mold will be black, brown/black, green to blue-green, or red to reddish brown. Mildew can sometimes be confused as mold. Mildew is typically white and not as dense as mold. If you think you see presence of mold there are test kits that can be used to identify the exact type of mold; however, they are fairly expensive and not usually necessary, as any mold should be remediated no matter the exact type. Basements: Being below ground, basements are more prone to having poor ventilation and greater moisture content. Some basements may be structurally sound and still will require a dehumidifier to take the moisture out of the air. Others may have foundation leaks or seepage that allows water penetration. Sometimes you will have pipes or shower drains that leak, releasing moisture into the basement. All of these issues can cause mold to grow in a basement and should be remedied to prevent mold growth. In basements, the key is having good air circulation. The most common way of accomplishing this is too have proper HVAC venting. This means ensuring that the proper layout of supply vents and cold air returns are present in the basement space. If you are planning on finishing your basement or remodeling it, you would be well served to have an HVAC expert review your plans to make sure you will have the proper ventilation. Attics: The leading cause of mold in an attic is a lack of proper ventilation. Air must be allowed to flow through an attic space freely or moisture can build up. Moisture can penetrate from the outside in the form of a leaking roof, improper bathroom vent that terminates in the attic, or simply by moisture permeating up through the structure of the home itself and getting trapped in the attic. Proper attic ventilation will have vents in the soffits along the lower edges of the roof to allow cool dry air to enter, and will have vents at the ridges of the roof to allow the moist warm air out. This is known as “passive” ventilation and in most cases is sufficient. Some houses, because of their design, may utilize a powered fan to exhaust the warm moist air out of the attic space. Bathrooms: There are two main reasons for mold in a bathroom. The first is no surprise, a lack of ventilation. A bathroom should have one of two types of ventilation; either an exhaust fan routed to the exterior, or a window. A common misconception of an exhaust fan is that it is to be used to dissipate foul odors from a bathroom. That is an added bonus to the presence of an exhaust fan; however, its intended purpose is to expel moisture from a bathroom area. The proper use of an exhaust fan includes running the fan the entire time a shower is being used, and for a period there-after. This ensures that moisture is not allowed to remain in the bathroom space for enough time to promote mold growth. A window has the same function, and should be cracked open during and after a shower so that the moisture is allowed to escape. The other cause of moisture build up in a bathroom is leaking fixtures, especially behind the wall or from the toilet wax ring. Often times, these leaks do not immediately reveal themselves, and by the time you do find them by stains on the ceiling below you have a real mess on your hands. When these issues are found, a qualified person should make the repairs to remediate the issue. Some other places to look for mold are in laundry rooms, crawlspaces, in kitchens under sinks and behind dishwashers. Once the presence of mold is confirmed, the cause should be repaired and the mold remediated. Bleach or ammonia will kill mold on surfaces. One warning though, you should never mix bleach and ammonia together as it will create a very noxious and dangerous gas called chloramine that can easily be fatal. If the mold is excessive, it may be best to hire a company to come in and do the clean-up for you. I have one final note. Just because a home has mold that doesn’t necessarily mean it should be eliminated from consideration as far as purchasing. If you can locate the issue and it can be reasonably fixed and the mold eliminated you just may have the bargaining chip in your pocket to get a great deal on the house. However in that situation an expert most definitely should be brought in to evaluate the situation.